Over the past few centuries, Penn’s Woods have taken a beating. What was once vast forest land as far as the eye could see is mostly pavement today. A 2003 study found that within the five-county Philadelphia region, an estimated five million trees had been lost over the previous 15 years. The most recent study on Philadelphia’s trees, completed in 2010, showed that the region had a tree canopy—the uppermost layer in a forest—of 20 percent, but identified an additional 49 percent (42,451 acres) where trees could be planted. Now trees are making a comeback. Once-barren streets are seeing plantings, as people remember their incredible value—providing shade, purifying the air, filtering pollution, absorbing noise and strengthening neighborhood connections. Trees have also proven to increase the value of homes. A collaborative partnership between city agencies, nonprofits and citizens is ushering in change, one tree at a time. TreePhilly, a Philadelphia Parks & Recreation Department initiative, gives away free yard trees to Philadelphia property owners. TreeKeepers, part of TreePhilly, is a seasonal maintenance team that handles a bevy of beautification and park clean-up projects. And Tree Tenders, a Pennsylvania Horticultural Society program, offers hands-on tree-care training, ongoing education and tree-planting opportunities across the region. TreePhilly started with some ambitious goals. In 2009 Mayor Michael Nutter released the Greenworks plan, which set a number of sustainability goals, including increasing the tree canopy to 30 percent throughout the city. To reach that goal, Parks & Rec would need to go beyond planting trees on public land; Philadelphia landowners would need to be encouraged to start planting trees, too. 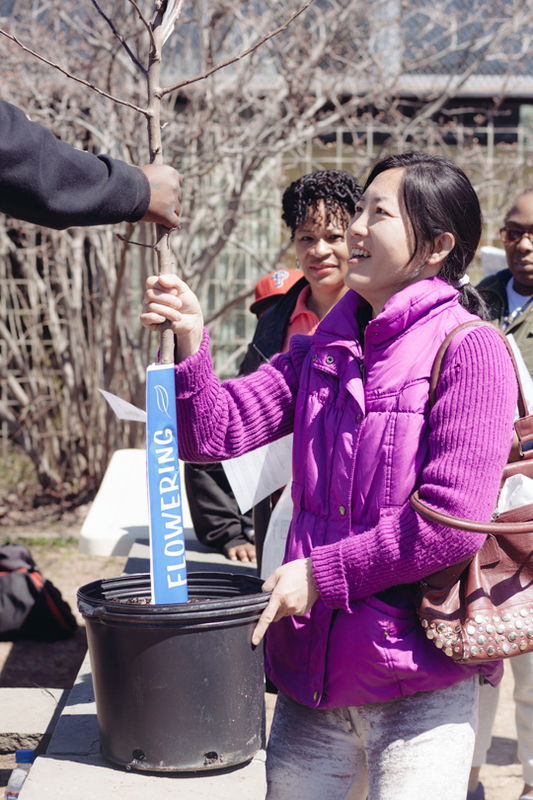 At each giveaway, TreePhilly sets up stations where residents grab information packets and a Wells Fargo swag bag before visiting a table of tree experts who help them choose the right tree for where they live. Smith Fichman says many factors are considered in that decision. Do they want berries or flowers? How big or wide should the tree be? Is there a lot of sun or mostly shade? 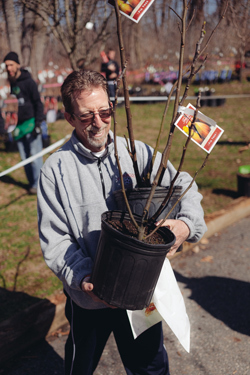 In addition to giving away larger shade trees, TreePhilly also hands out small flowering trees, and this year, they added fruit trees so people have more options. “Not everyone gets excited about a large shade tree,” she says, laughing. TreePhilly started giving away fruit trees at the Fall 2013 giveaway. The fig trees are especially popular. 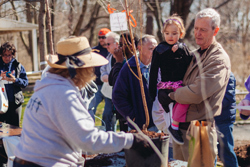 TreePhilly partnered with TreeNE and the Friends of Pennypack Park to give away more than 650 trees on April 5 at the Pennypack Environmental Center.Residents can’t register for a specific tree, but when they arrive at a giveaway, they often have a tree in mind, thanks to the educational emails TreePhilly has sent. After a tree type is chosen, volunteers demonstrate how to plant the tree and give residents mulch. Staffers and volunteers package the tree and even help strap it to their car—or to a bike, as one resident did. (A Drexel frat even picked up a tree using their keg trailer.) The education doesn’t end there. TreePhilly follows up to thank you for attending, see whether there are questions and share information on Tree Tender classes. In addition to giving away free yard trees, TreePhilly signs people up on behalf of the City of Philadelphia to get a street tree planted by contractors. 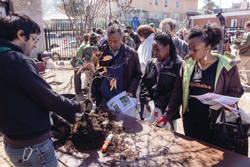 In addition to the City, other partners have rallied around TreePhilly as it greens Philadelphia, including UC Green, an environmental volunteer stewardship in University City and surrounding communities; Philly Tree People, a nonprofit organization that organizes tree plantings in East Kensington, Kensington and Fishtown; and SERVEPhiladelphia, the Mayor’s Office of Civic Engagement and Volunteer Service program. But, like many Parks & Rec programs, TreePhilly is reliant upon volunteers. Brooke Allen, 38, has been volunteering for two and a half years at the spring and fall tree giveaways. She and her boyfriend, Matt Migliore, are active volunteers at Mifflin Square Park in South Philadelphia, and learned about TreePhilly through the program’s yard tree giveaway there. Allen enjoys working with TreePhilly because the program goes beyond just handing off a tree to a resident. The giveaways have grown so popular that TreePhilly staffers and volunteers have had to turn away walk-ups, Smith Fichman says, adding that staffers instead encourage them to sign up for the next tree giveaway. The popularity of the program is important. If you’re ever walking along a sidewalk or through a park and an annoying low-hanging tree branch doesn’t thump you on the head, you can probably thank a TreeKeeper. The Parks & Rec program is a part of TreePhilly and aims to train paid workers in all aspects of arboriculture—learning to identify and remove invasive species, improving stormwater infrastructure through maintenance, clearing trails, planting trees and more, including clearing tree branches and overgrowth. TreeKeepers Josh Burno, Calvin Nixon, Jesse Leary and Jorge Vera take a break while preparing Inn Yard Park in East Falls for Arbor Day festivities. Photo by Cynthia KishinchandTreeKeepers was established in 2011 when Joan Blaustein, the division director of Urban Forestry & Ecosystem Management at Parks & Rec, partnered with the Pennsylvania Horticultural Society to use a Forest Service grant to create the program. After the first year, the program was fully turned over to Parks & Rec, which paired it with TreePhilly to provide a maintenance arm. Andrew Emma, TreeKeepers’ program manager, has been with the program since the beginning and manages eight full-time crew members and a crew leader. The team works nine months a year (recently increased from six months), April through December, working at the more than 300 parks, recreation centers, playgrounds, health centers, and police and fire stations. The crew has planted trees at schools; assisted TreePhilly with yard tree giveaways; helped to train people enrolled in the environmental stewardship jobs program, Power Corps PHL; taken part in Mayor Nutter’s Arbor Day events; and even worked alongside the Philadelphia Phillies on volunteer excursions. The crew works with Tree Tender groups, volunteers and local park Friends groups to keep parks and green spaces in tip-top shape. Students from the Chester A. Arthur School help mulch a street tree for TreePhilly's Arbor Day event April 25 at Seger Playground. Photo courtesy of TreePhillyEmma says he encourages the crew to undergo Tree Tenders training, “so when they join, they have a little bit of background [and understand] why trees are important.” It’s his aim to retain the crew from year to year so they can expand their base knowledge and set the workers up to be leaders. Many of the TreeKeepers are ex-offenders, Emma says, which adds an even greater sense of community to the program. When TreeKeepers was created in 2011, it worked with a PHS initiative called Roots to Re-Entry, a 14-week green skills training program that helps inmates in the Philadelphia Prison System find employment in local food production and landscape management upon their release. When TreeKeepers was starting, it was natural to pluck two former inmates from Roots to Re-Entry. While neither are with the program today, Emma says that the program continues to draw ex-offenders. Mindy Maslin, project manager of Tree Tenders of Philadelphia, explains tree maintenance to attendees at TreePhilly's Northeast Tree Giveaway at the Pennypack Environmental Center in early April. Tree Tenders was born more than 20 years ago out of need. In the ’90s, there weren’t many programs that aimed to plant more trees in Philadelphia. Mindy Maslin, project manager of Tree Tenders of Philadelphia, was hired by the Pennsylvania Horticultural Society in 1991 to manage youth programs, but she began learning about community tree stewardship programs around the country. One in Chicago particularly caught her eye, and spurred her to start a similar program in Philadelphia in 1993 that utilized her background in social work and community organizing. Today, there are more than 4,000 Tree Tenders and 50 Tree Tender neighborhood groups, Maslin says. The program offers hands-on tree care training in the region, and during the nine hours of training, covers tree biology, identification, planting, care and how to work in a community. Tree Tenders planted 850 street trees during the last weekend of April. To help create those green places that people crave, the Pennsylvania Department of Conservation and Natural Resources (DCNR) launched TreeVitalize, a statewide public/private partnership. That initiative has taken the Tree Tenders training statewide and added 150,000 trees to Pennsylania since 2004. PHS has expanded that mission even further with their Plant One Million Campaign, a three-state, 13-county effort which aims to plant one million trees in southeastern Pennsylvania, New Jersey and Delaware. Maslin says it’s the largest multi-state tree planting campaign in the country. As of the end of April, “we’re at 300,850,” she says. To get street trees planted in a neighborhood through Tree Tenders, three residents need to complete training, then submit an application. PHS sends those applications to Parks & Rec, which then picks a species—Maslin says they work with about 45 different varieties—and takes into account overhead wires, sidewalk shape, plant diversity, and whether the tree can handle the challenges of growing in a city, including the onslaught of salt and ice that winter brings. PHS, like many of the other tree planting programs, always aims to plant native trees, but because of climate change, many of those native trees are no longer thriving, so PHS started providing hardier non-native trees with better survival rates, like the ginkgo tree. But it’s not as popular as other species of trees. “When people ask me, ‘How do you get rid of those berries?’ I say, ‘Find a good recipe,’ ” Maslin says, laughing.